“How was it?” everyone asked, when I came back from teaching The Art of Practicing Institute’s first summer program a few weeks ago. I couldn’t describe it, so I said things like “Spectacular!” and “Amazing!” And then I tried to explain why: the great people, the way they transformed over the week, the beautiful green campus with a lake in the middle and wonderful music facilities. But as the program receded further into the past, the central theme that kept emerging for me was community. We became a community in which everyone felt safe to be themselves, as musicians and as people—with their strengths and weaknesses, hopes and fears, convictions and insecurities. Some participants said they felt they have to hide when they’re with colleagues at home—they don’t feel free to share their enthusiasm about music in an environment where everyone is talking only about how many concerts, auditions, or pieces they’re playing. They wished their fellow musicians would show their vulnerability more and communicate more of their deep feelings about music. Many said they felt hopeless and discouraged as performers—experiencing intense stage fright, painful practicing, and the pressure to play “perfectly” in order to keep their jobs and make a living. Some said they have trouble appreciating themselves for working hard, no matter how much they push themselves to practice more every day. And most of them expressed a longing to develop the kind of freedom and confidence they’d seen and heard in performers they admire. With all of this openness and honesty, everyone began to relax and to find some comfort and nourishment in just being together. It was clear they were all in the same boat—a friendly environment they could grow and thrive in. Of course, everyone was also working hard—with mindfulness techniques all day, in music workshops and in the practice rooms, and in meditation sessions. And slowly, some wisdom began to grow from applying such healthy discipline—a discipline based not on pushing themselves but on continually relaxing that push and opening up both to the increased ease and beauty that resulted in their playing and to the increased emotional vulnerability that came with it. So our community was definitely based in a mutual willingness to explore this particular approach to working with music. But it was the shared humanity that made the work powerful. When people opened up about difficulties they encountered in the work, they were met with caring and understanding. And when they expressed joy and delight in new discoveries, everyone celebrated with them. This group support helped each participant to stick to the program and to gradually develop more confidence in themselves and in their playing. In fact, the group support was so strong that it has continued past the program, in our own private Facebook page, via e-mail and phone, and in plans for future work and get-togethers. You may already have such a nourishing musical community. If so, you are very lucky. But if you don’t, I’d like to offer some ideas on how to make it happen. First, forming a truly supportive community takes time and self-reflection. It begins with being honest with yourself about what you long for and who your closest supporters are already. Here are some of the things I’ve done to form my own community. A couple of years before the summer program, I wanted to expand my circle of support. I looked for people who shared my deepest values, and asked them to join me in my efforts to help musicians. I was lucky to find many people who contributed to the success of various projects, including the summer program: my amazing board of directors, my business coach, friends, and colleagues. Without that strong base of support, I couldn’t have created the summer program or the community that grew out of it. Then I learned more about community during the program itself—including how essential it was for me as the program director to have close colleagues there with me. These were the assistant teachers—whom I chose because they too shared my deepest values. One of these teachers doubled as our magnanimous administrative director. Just to give you an idea of how valuable a supportive colleague can be, here are a few of this person’s many gifts to us: He arranged for the program to happen at his university; he personally equipped our dorm rooms with linens, hangers, kleenex, and snacks; and he made sure that everyone’s special diets were accommodated. He also moved his office refrigerator into my room and brought me all the specific foods I requested, plus others he thought I’d like. And almost every day he’d say on the phone, “If you need anything, I’m just 20 minutes away.” He made it easy for me to focus on my job of teaching and leading the program. And his complete attentiveness to everyone’s needs made all of us feel at home and extremely well taken care of. He and the other assistant teachers also provided further essential support. They guided participants in ways I hadn’t thought of. They gave me valuable feedback on my teaching. And they extended themselves as friends, sharing things about themselves and listening to me talk about my work and my life. I’d never experienced such willing and genuine support as a teacher. We were a team, and they infused me with increased enthusiasm and vitality every day. How can you find such supportive, wonderful people to make your own nourishing musical community? It begins with asking yourself some questions. Who would you like in your ideal community? What qualities would they have? What would you like to share with them? Are you willing to risk opening up to any of your colleagues now and find out if they understand or share some of the experiences that are most meaningful to you? Is there something you would like to make happen? More performances? A new ensemble? A working relationship with a coach or mentor? Who could you consult to make these things happen? What kind of support do you need? What kind of musical life would really fulfill you? What is the first step you could take to make that life a reality? Being a musician requires so much of us—tremendous work, training, and courage to put ourselves out there as performers and teachers. The culture often does not support us as we would like it to. Money can be hard to make. Concerts can be hard to come by. 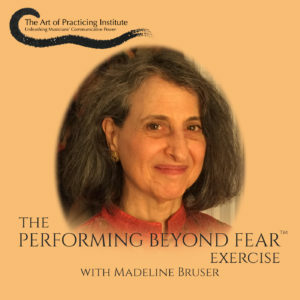 We struggle with tension, injuries, and stage fright. And we spend enormous amounts of time isolated in practice rooms. Our public knows little of what we go through—how hard it is to coordinate our body, mind, ears, and emotional energies into creating a beautiful, communicative performance, and then, on top of that, to deal with the business aspects of being a musician. But we know, and in spite of the tough competition we may face with each other, we have so very much in common. The main thing I learned at the summer program is how much we need each other as musicians. We are a tribe, and we can receive tremendous nourishment from simply sharing ourselves and our experiences with each other on a regular basis. In a healthy community, people appreciate each other and encourage each other’s growth. Here are some ideas to help you create the community you want. 1. Tell a colleague how much you’ve enjoyed a particular aspect of their playing—their special sound, the way a certain note or phrase in their performance really touched you—anything you genuinely feel. Ask them how they did it, or how they experienced what you heard. 2. Ask yourself if there is a colleague you’d like to know better. Invite them to have coffee with you, and tell them something personal about yourself as a musician, such as, “I just discovered this __________________ (book, violinist on YouTube, new way of practicing octaves, whatever) that I’m excited about.” See if your enthusiasm brings out some of their own. 3. Admit to a colleague that you have stage fright, and mention that you’ve experimented with certain ideas for working with it. See if they open up at all about their own experience with stage fright. 4. Seek out like-minded musicians by attending seminars or workshops on practice or performance issues. An amazing thriving community is currently available to you through The Art of Practicing Institute’s new Online Video Groups. The musicians in these groups have been incredibly open and supportive of each other and have benefited enormously from the teaching and from each other’s kindness, intelligence, and humor. We have just 4 spots open in the Basic Group, and one person on the waiting list for a second Premium Group. Whatever you do, listen to what your heart desires from your fellow musicians, and don’t give up in your search for what you want. It may take a while to find it, but remember that deep down, perhaps under layers of jadedness, hurt, and cynicism, all musicians feel a powerful love for music and a longing to fulfill themselves musically and in a community. Look for those who appear more likely to reveal such feelings. P.S. If you’re ready to try out an experience with our thriving community, our Online Video Groups meet live twice a month. I warmly invite you to apply. Another very important thing to do is to seek guidance from a good teacher—to make sure that the way you’re practicing your instrument is really serving you and helping you play as well as you can. No one can do it alone, and in seeking help from someone else, you are honoring your own intelligence—it means you already have the wisdom to sense that you could benefit from some guidance. So you could take heart from that and follow your intelligence. In that way, your intelligence will keep developing. Finally, it is invaluable to have a supportive community of other musicians who are brave enough to share their own vulnerability and who want to live in genuine collaboration with each other rather than intense competition. I invite you to consider joining one of The Art of Practicing Institute’s Online Video Groups, where you will find just this kind of welcoming community. It is tremendously energizing and encouraging to have such a community—and a lot of fun.